Fruit. 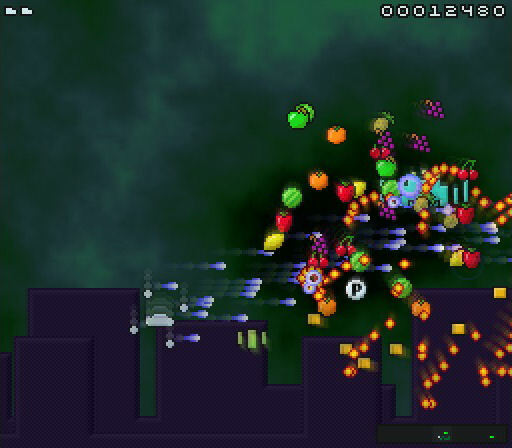 One of the staples of a healthy diet, and surprisingly also one of the main constituents of Contralogic's recently released arcade shooter. Imagine the Williams' classic Defender, but without the humans to protect. Now contemplate that instead of dying in a glorious shower of exploding pixels, every time an enemy is killed they instead send pieces of yummy score-awarding fruit flying everywhere instead. That in a nutshell is Riesling. Apart from it isn't - behind the novelty there's actually a pretty solid shmup to be found, with tight controls and some intense on-screen carnage. Sure, the candy-coloured coder graphics aren't much to look at, but for a game that clearly started as a visual gag the actual design has been particularly well-executed and the vintage Amiga-esque soundtrack and cute coin-op effects are as sweet as the aural equivalent of a banana and strawberry smoothie. 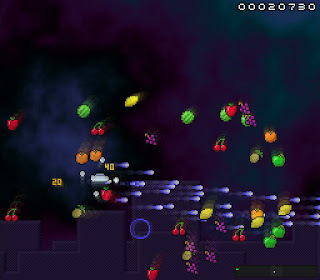 Riesling starts of quite sedately with only a few drone-spawning alien ships to destroy, but by the time you reach wave 10 there will be bullets and fruit zooming all over the screen. There are a good variety of different Defender/Stargate reminiscent enemies (each with their own method of attack and fruit bonus) and power-ups to add extra bang to your ship. Also, for people who aren't fans of playing shoot 'em ups via mouse control, thankfully there's an option to use joypad as well (although it would have been nice to see standard keyboard controls with inertia as well). 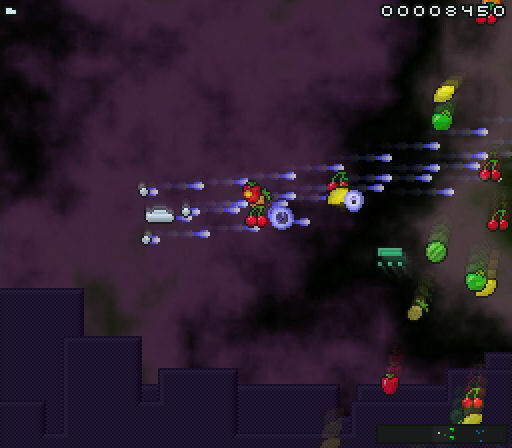 I'm not going to pretend that this is a classic game you'll still be playing years or even months from now, but there's no denying that Riesling is a lot of fun and those explosions are guaranteed to raise a smile. Enjoy it while it's fresh. Download the game here (from the Contralogic website). (Thanks to Pixel Prospector for the news).